Shop for your Family and Earn Money for Dowell! 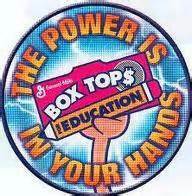 Dowell earns $.10 cents for every General Mills Box Top you turn in? Cheerios, Betty Crocker, Pillsbury, Kleenex, Ziploc, and Juicy Juice. Win PRIZES in our Spring 2019 Box Tops Contest. See Tuesday's Lion Latest for details. for name brands to look for when shopping for your family. Thank you for supporting Dowell Middle School!